Parks Associates announced new research today showing streaming media players are the most frequently used Internet-connected entertainment device, with 41% of owners using their players daily or almost daily. Only 34% of smart TV or smart PVR/DVR owners use these devices daily. The firm’s 360 Deep Dive: Streaming Device Use and Setup in the Connected Home shows that among consumers who say their streaming media player is their preferred device for accessing online content, they report spending 10.4 hours per week watching online video content on this device. The new research by Parks Associates shows that owners of smart TVs spend 9.8 hours per week watching pay-TV content and streaming media player owners watch content from online services 10.4 hours per week. While almost half of U.S. broadband households own a gaming console, only 37% of households actually connect that device to the internet. 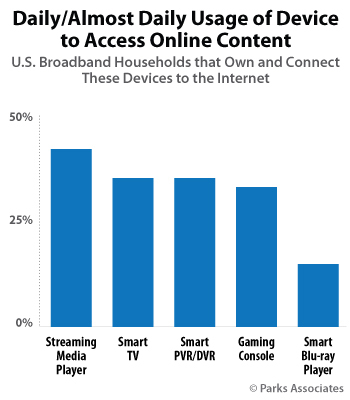 44% of U.S. broadband households connect a smart TV to the internet, while 53% of households own this product. Over 34% of streaming media player owners now own an Amazon Fire TV, up from 28% in Q1 2017.